Game action during the Division II Championship Game between the Amity Spartans and the Immaculate Mustangs played at the Mohegan Sun Arena on Saturday March 17, 2018, in Montville, Connecticut. UNCASVILLE — Give Immaculate a decent lead and the Iron Five will just grind it out on offense until you find a way to take the ball from them.The Amity Spartans never figured out how to stop the Mustangs on offense. The No. 2 seed sliced No. 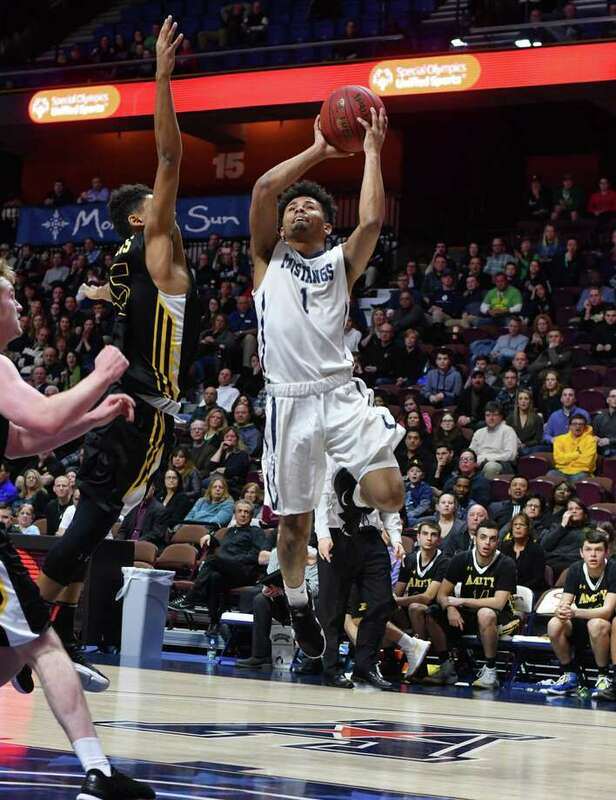 9 Amity to shreds in the second half, taking the Division II boys basketball state championship going away 53-34 Saturday night before 4,996 at the Mohegan Sun Arena. Immaculate (22-5) held Amity (20-7) to just one field goal in the fourth quarter, three overall points in the final period and 11 points in the second half. It was the lowest point total in a CIAC boys state final since 2009. The Iron Five didn’t come out until the final minute, game well in hand. Jack Woods led the Mustangs with 18 points while Jack Woods and Isaiah Payton each had 13. Ronan Doherty had just two points in his final performance for Immaculate. But it was his contributions on the other end of the court that made a huge difference and earned him the game ball from his team. Doherty drew the defensive assignment on SCC Player of the Year Tyler Thomas. After a 16-point first half, Thomas had just one second-half point in his final performance for the Spartans. The 17 points leaves Thomas, who played for just three years, two points short of the all-time school scoring record, held by Ed Goldstone. Thomas finishes with 1,533 career points. Thomas wouldn’t blame his left wrist, which he injured on a dunk attempt against Newtown and reinjured it early in Saturday’s second half. With Thomas cold, Amity, making its first appearance in a state final, had nowhere else to go. Tanner Thomas was next with six points. Tyler Thomas was on fire from the start, finishing with eight points in each of the first two quarters. He hit two 3-point shots in each period. Immaculate ran off the last six points of the first half with Jack Woods scoring just before the halftime buzzer sounded to give the Mustangs a 26-23 lead. The Thomas brothers combined for 20 of The Spartans’ 23 points in the first half. John Nolan 0 0-0 0 Joseph Benedetti 0 0-2 0 Tyler Thomas 6 1-2 17 Brian Curtin 1 0-0 3 Chris Bierezowiec 1 0-0 2 Sebastian Formica 0 0-0 0 Marc Chodos 0 0-0 0 Nicholas Huribal 0 0-0 0 Michael Young 0 0-0 0 Quinnlan Burke 0 1-2 1 Tanner Thomas 3 0-0 6 Shaun Graham 0 0-0 0 Cole Wissink 2 0-0 5. Totals 13 2-6 34. Isaiah Payton 5 3-5 13 Michael Basile 3 1-2 7 Jack Woods 4 3-4 13 Quinn Guth 6 2-2 18 Ronan Doherty 1 0-0 2 Joseph Rios 0 0-0 0 Sean Guiry 0 0-0 0 Jack Deakin 0 0-0 0 Christian Johnson 0 0-0 0 Jack Guiry 0 0-0 0. Totals 19 9-13 53. 3-pointers: A — Thomas 4, Curtin, Wissink; I — Guth 4, Woods 2. Fouled out: A — Nolan. Immaculate played great team ball. Amity, not so much. A big congrats to IHS. Just a real solid team. The SWC has two more teams in the finals today. Are they the power conference for CT hoops? Possibly. Brookfield won last year. No they are not, but the league played very well in the tournament, better than alleged experts like me expected. But if ND-Fairfield prevails tonight, the SWC has a legitimate argument. How good was this IHS team? I’m hearing they were a fun will Coached team. Very good, they spread the defense and can shoot. They take very good care of the basketball and defend well. The shot clock will change everything for a team like this! I saw the team play several times this year. This team was unique in that they started 5 guards all season. All under 6 feet. All attacked the basketball well and all great shooters. They played extremely hard on defense…very pesky. SWC turned out to be the best conference this year no doubt. 3 state champions…is that a record? In 1996 3 FCIAC schools won titles. I THINK this was the last time a conference won 3 in the same season. Looks like the last time a conference won 3 state championships in the same season was the FCIAC in 1996. I BELIEVE this was the most recent occurrence until this past weekend.